Going in I knew the film was going to take place in the mid-nineties and it would be Carol Danvers origin, and these stories can be a lot of fun, if not a little overdone. But thankfully Marvel Studios decided to alter the typical layout of an origin story. Unlike with Iron Man where we follow Tony Stark from his beginnings in the cave to his declaration, with Vers, aka Captain Marvel aka Carol Danvers, we see her as a full member of the Spaceforce preparing for battle. Despite only having six years of memory, she was certain of that short past and her journey forward. But as the movie unfolds, she finds herself on a path of rediscovery. It was a nice spin on a classic tale. Another thing to note before we go too much further, despite the movie taking place about two decades before Iron Man, I have heard plenty of talk that the film would be a lead into Avengers: Endgame. And it performed that job just as well as Thor: Ragnarok did introducing Avengers Infinity War. Also, this story is not just about Carol Danvers’ origin, it also serves as an origin story for Nick Fury. Throughout the movie, we are introduced to a side of Fury that we have never seen, an individual who is far more trusting. During the film, we are treated to a character arc that takes this trusting man and sets him on the path to the cynical and clandestine individual we know and love. And their interaction is almost as central to the movie as her own past. It is funny watching Fury as he tries to arrest her after falling through the roof of a Blockbuster. Now before anyone accuses me of thinking Fury stole the movie, I want to discuss the complaints I have heard about Brie Larson’s performance. I can’t remember where I heard that the performance was wooden, but I would like to address it real quick. At the beginning, we are treated to a sparring match between Vers and Jude Law’s Yon-Rogg, and during that fight, he flat out tells her that emotion is the enemy and she needs to suppress it. 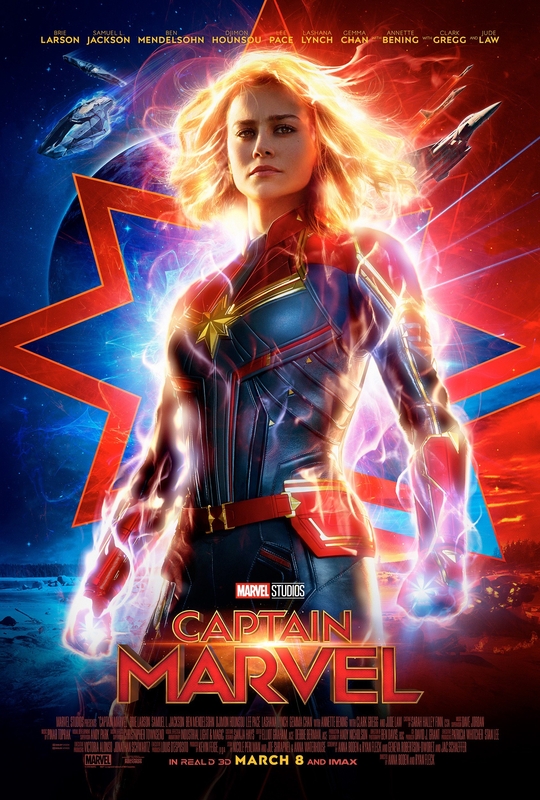 But throughout the movie, as Captain Marvel begins to regain her lost memories, her personality begins to shine through the Kree upbringing. The movie’s pace and flow was well done, giving us the information we needed at the right time without disrupting the experience. The only nitpick I have is the use of Deus Ex Machina when Captain Marvel uses the Kree technology from in her suit to hijack phones so she can communicate with her team. Conversely when a member of that team needs to communicate with some Kree vessels no phone is required to make that call. Though, we did get a funny joke about long distance calls with Captain Marvel’s first. And speaking of nostalgia, the film manages to cram into the movie everywhere. Be it the trip inside Blockbuster Video or the loading screen for reading an audio file from CD, it brought me back to my youth and a smile to my face. Nick Fury: You know how to fly this thing? Fury: That’s a yes or no question. Also since it seemed that Goose, the cat, got so much in the promotional side of things, it is worth mentioning that he was an excellent addition to the film, and not just as the center to Fury’s adoration. In short, this movie felt like a movie that could have been shown in phase one, but I understand their decision to produce it now. After walking out not only did I enjoy the film but I was even more excited to see Endgame.